The correspondence between Michelle - Barack, their inner circle and me continues and will soon be collected and published as a handbook on how to enjoy an intimate friendship with all of it’s emotional benefits without actually meeting the person. I have the distinct feeling that Barack and Michelle have lowered their expectations of me. They’ve asked me every which way to come and have dinner with them. The deterioration is obvious in the phrasing of the sequential invitations' subject lines. I’m saving a seat for Consuelo. We’re picking up the airfare. Some grub with POTUS? 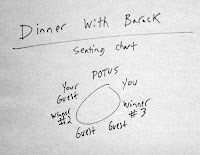 (in case I was a “Grizzly Adams” and didn’t cotton to fancy talk,) their recent request was titled: “Some Grub With Potus?” You, President Obama, a table, chair, and some grub. They spelled it out for me. Finally, as if I needed them to draw me a picture, they drew me a picture. The seating arrangement. As in what the heck is wrong with you? Don’t you get it? Jeremy Bird, someone I’ve not heard from has written to ask me to make a difference in the battleground states. It sounds as if he wants me to dig a foxhole in rural Ohio and lie in wait for some hapless citizen to stroll by, yank him in and say howdy, stranger. Jim Messina continued the battle lingo just before the vice presidential debate. Whatever happens at the vice presidential debate tonight, we need to respond quickly and forcefully. As soon as VP Biden walks off that stage, we need to be ready to fire all cylinders. I thought maybe I should buy a gun or at least a baseball bat because there might be a rumble right here on Newtown Lane. The following e-mail was meant to bolster my self-esteem in case I didn’t feel important enough to have the president’s back, stand with him and be the primary lynchpin of his political success. Look, Consuelo, these normal, middle-class people also have the president’s back. This list is eye-opening on two counts. I don’t know why Virginia, a state that I always thought was somewhat rural, needs so many dog walkers and why the heck are there so many photographers in Ohio? On Oct. 12 I received this horrifying e-mail: Here is your online giving history. It looks like you haven’t made an online donation to the campaign yet. If you were waiting for the last minute, you’re pretty much there. The president is counting on people like you. Really? With my dismal giving record and my lack of energy to go fight in the battleground states, why is the President counting on people like me? He has a better shot with the 177 photographers in Ohio. Oct. 12 as if to assuage my guilt for the big goose egg donation, the president wrote to confide. Consuelo -- How about Joe last night? If you’re as proud of him as I am, let’s do what needs to be done. (What? Call the men in the white suits?) I thought the president was cringing on the couch just as I was while Mr. Biden kept laughing and generally acting all aggressive and goofy. I thought he was going to say, How about Joe last night? Did he look as scary to you as he did to me?I know we’ve asked a lot of you over the last 18 months. Yes, you have especially asking me to keep up with those dog walkers in Virginia. Then he asked me to remember one thing: the debate wasn’t about him or Congressman Ryan. No? I thought it was just about you. So if you’re standing with Barack and me like we’re standing with you. I looked around to make sure he wasn’t really in the room because frankly, I’m a bit afraid of Joe. And she meant it. A very nice man on a video also told me to pack my bags. Bill Clinton doesn’t fool around with pleasantries and folksy salutations. I hope you’ll pay attention, Consuelo was how he began. I was barely awake but I slapped myself into alertness to listen to Bill. Ann Marie Habershaw wrote and said, I’ve got to be honest. Uh. Oh. 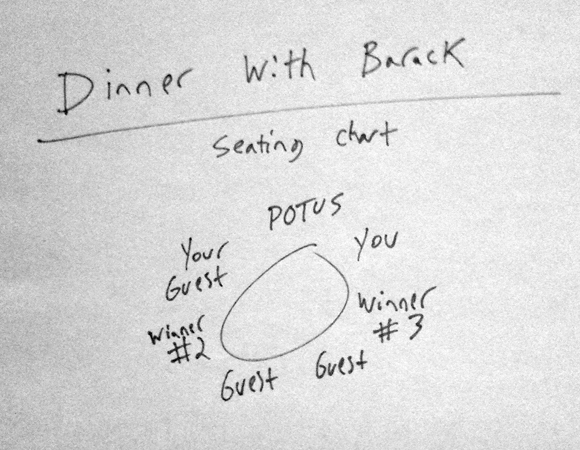 I don’t care who wins this last dinner with Barack, she said. Sure this dinner will be a once-in-a-lifetime experience that you’ll tell you grandkids about. but frankly my dear, I don’t give a damn. She didn’t say that last part but I kept thinking of Mammy and Scarlet and Rhett. Whenever the e-mail is from Joe Biden, I become afraid. This one said “Look, you’ve really got to get involved here” Yikes. They had read my statistics and sent Joe after me. On the same day, Rufus Gilford wrote: If you want to wake up on November 7th to four more years of President Obama and not the alternative. You’ve waited until the last month to own a piece of this campaign. Uh Oh. They know. David Axelrod, who has never e-mailed me before said: Consuelo, I’ll be blunt. I thought he was going to say: “you’ve gained weight and your house could use a good vacuuming”. I couldn’t continue reading. When someone says, I’ll be blunt, feelings are going to get hurt. He closed with a line, I could not understand unless it was said in a Western movie. We need to keep fighting and get the back of the guy who’s got ours. Thanks, Let’s keep this up. David. I thought ...what? Should I clean the house, buy a gun, lock the door? What David? Keep what up? Stephanie Cuttler sent me a anniversary video showing Michelle and Barack in younger days kissing and nuzzling. There was a shot of a very young Potus feeding Michelle ice cream. It was nice and the music was nice. Yohannes Abraham wrote to tell me that 16,999 people named Consuelo were already registered to vote. They asked me to get my family and friends registered. So much for feeling special. What's the big deal about truth?